Back in 2010, I had no idea that the ten week Teenage Songwriting course at Skipton Library would last for six years and completely transform both the way in which I would work and the way the library service in North Yorkshire would be delivered in the future. The youngest original participants are now progressing well with their University courses and there are now other opportunities within Skipton for young people to access music and song writing skills. Sadly, partly as a result of this, the Rewind Skipton Songwriters group has decided to wind up. The great news is that Rewind has a great legacy here at Skipton Library and, as a direct result, there are now many more opportunities at all North Yorkshire Libraries for young people to meet together, explore ideas, develop skills and do some really amazing things. We have at least 16 Reading Hacks year round at Skipton Library who initiate and deliver activities and promotions within the library linked to the Universal Offers. In 2016, they organised and delivered events for Harry Potter Night, National Libraries Day, Shakespeare Week, Big Friendly Read, and Get Reading to name but a few. In the 2016 Summer Reading Challenge alone, Skipton Library’s Reading Hacks delivered 529.5 volunteer hours. It’s really wonderful to hear their ideas and give them the trust, support and resources to deliver. They’ve developed confidence and organisational skills and they come up with ideas which we would never have dreamed of. We have been working with Pentabus Theatre Company to deliver a young writers group for 16-25 year olds. The group is partnered with another group in Shropshire (where Pentabus are based) and the 2 groups meet once a month (on the same night) to learn about playwriting. Each month the groups work with a different artist, writer, actor or director and they are using social media and other networking technology to share and discuss their ideas. In June, I enjoyed watching the theatre company perform eight short plays at Skipton Town Hall, and the plays were also performed in Ludlow. It was amazing to see how the writing from the workshops transferred to the stage and engaged the audience. It was a wonderful and inspiring experience for the writers and we look forward to a new series of writing workshops which are due to begin in September. 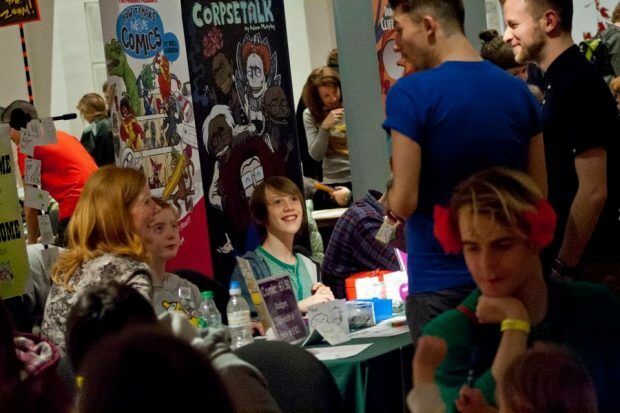 In 2013, we had a request from a young girl and her Mum to find out if was possible for her to take part in the British Comic Awards (she really enjoyed reading comics). As a result, we formed a group to read and discuss the titles and be part of the judging process. Some of the group were able to attend the awards ceremony in Leeds and they were so inspired by Sarah MacIntyre that their next request was to create and publish their own comics. We’ve had a comic book club called Team Ketchup for year 6 upwards ever since then. There are approximately 30 young people and 3 adult volunteers involved and there’s a waiting list to join. The group read, discuss and vote for the winner in the Young People’s category in the British Comic Awards each November and attend the award ceremony. They’ve secured funding and self-published 5 comic books. 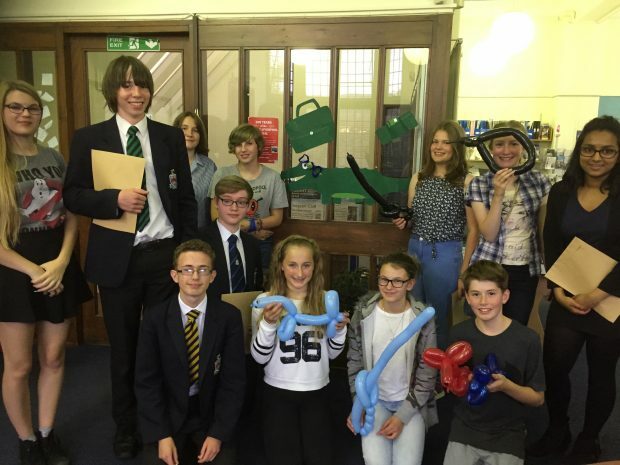 The young people have funded, organised and hosted a number of artist workshops and community events in the library. Team Ketchup have won 3 community awards, and were even invited to be keynote speakers at the British Comic Awards ceremony in 2015. That’s the teenagers themselves, keynote speakers about how to set up and run a library comic book club and publish your own comic! It’s truly amazing what young people can do with support and encouragement. Team Ketchup are well established in the northern Comic Book scene. In recent years, they have stalls and run activities for families in Royal Armouries Hall at the Leeds Thought Bubble Festival. You can follow them on twitter @theteamketchup. The older members of Team Ketchup also run a club for primary aged children called Ketchup Splatts. Splatts helps to solve the problem of a waiting list to join the club and has developed new skills in the older teens. In a six week Splatts session, the kids explore comic books as a tool for narrative, look at character and plot development and how to create a comic that works. Countywide, the Skipton Rewind model has been extended to young people and other target groups through our Arts Council supported Creative Residencies Project. The three year project has seen 24 artists working with eight library locations countywide. Workshops have included songwriting, photography, stop frame animation, creative writing, puppet making, mosaic making, felt making, machine embroidery, film making and graphic design. Target groups have included young people, isolated older people, people with dementia, visually impaired, unemployed, people with mental health issues, military families, and travellers. We have now reached the end of the third year of the project and held events in the spring to celebrate the works created. The evaluation process and case studies indicate that this project has been successful in its aims of increasing the audience for libraries and participatory arts activities in libraries; changing the public and artists’ perceptions of libraries, developing cultural partnerships and developing the role of libraries as cultural hubs. Delivering the project at such a time of change within regional and national library services has also raised new questions about sustainability and skills. The next phase of the project is to work directly with volunteers and trustees of the Community library groups to help them to recognise the value of planning and delivering high quality art workshops from their library, to continue to develop their library as a cultural hub, and how to make this a sustainable goal. Rest assured, even though the time for Rewind Skipton Songwriters has come to an end, I’m confident that the experience and the skills developed by all through that original project are more relevant than ever. We’ve moved with the times and continue to lead the way identifying the trends, models and best practice for future library services.